When I restore from hibernate the screen is often corrupted. I suspect the graphics memory is not being saved. Suspend-to-ram works fine otherwise. It also looks like the font-cache is corrupted, as all letters are corrupted consistently. The effect seems to target a font at a specific size. E.g. if my terminal window is hit, changing the font and/or the font size will fix it, unless that font with that size is already damaged. If the font is used elsewhere (other apps, window manager, etc. ), then the problem is there as well. Sometimes the font used for the window titles is hit, then all window titles show the same letters corrupted. Logging out and back in again fixes it, but I don't want to have to do that. I have been logging-out then hibernating, but this is more effort and eliminates most of the benefit of hibernate. Is there another way to refresh the X11 display? The Ctrl+Alt+F1… does not fix it either. It switches terminal but does not redraw anything: It just shows the old corrupted screen. I am using Debian 6. Once you find the right command, assign it a shortcut so you can run it even when the screen is blank. In GNOME 3, AltF2renter refreshes the GUI. AltF2 launches the Run Command prompt, and the r command forces a refresh. Did you try the xrefresh command? 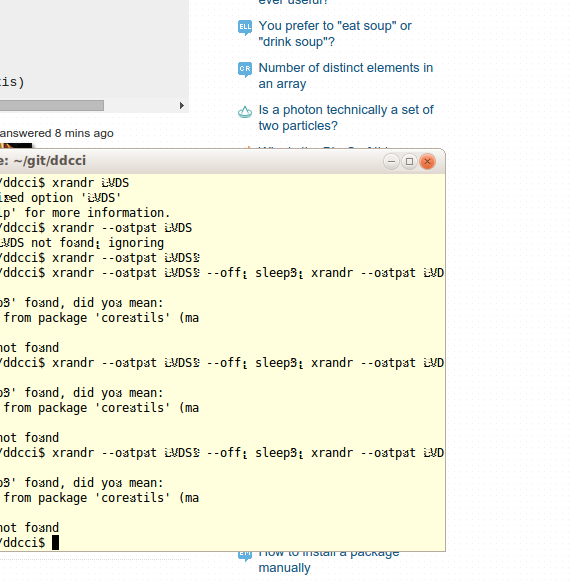 I'm having this issue too (Debian Squeeze and Wheezy). In my experience, it happens mainly when most of the memory is full and the system is using swap memory. I have that Intel GM45 mobile chipset with integrated graphics. The Acer laptop of the OP was also sold with that chipset (not all though). If a driver is failing to resume a device properly, then I believe the only solution you will find will be in debugging and identifying where the problem is so you can decide what to do from there. For example, I don't see how you can refresh if the video card is not reinitialized. First, there are several kernel parameters, that can be tried out. Just add them to your "kernel"-line in /boot/grub/menu.lst. More information about those can be found in /usr/src/linux/Documentation/power/video.txt. During S3 resume, hardware needs to be reinitialized. For most devices, this is easy, and kernel driver knows how to do it. Unfortunately there's one exception: video card. Those are usually initialized by BIOS, and kernel does not have enough information to boot video card. (Kernel usually does not even contain video card driver -- vesafb and vgacon are widely used). More at video.txt Refer to the table here to see if a known acpi_sleep=<hack> is listed for your video card model. A very common issue found after the computer resumes is corrupted video (or black screen, or no LCD backlight). The first step is to check whether the system is still running, which can be simply done by pressing the Capslock button and check whether the Capslock LED is changing accordingly. If the system is still running, in most cases we need to add a video quirk for your video card. Debian now has kernel mode setting (KMS) enabled by default for most Intel, nVidia and ATI video cards. But pm-utils' video quirk does [not] support KMS yet. So in most cases you should try disabling KMS first. The detail steps for your specific video card can be found on the KernelModesetting page. After disabled KMS, if the video after resume still corrupts, you can try to suspend the system by using some video quirks. Read the manpage of the pm-suspend program for a very detail explanation of all the quirks available, and try the combinations of them from commandline. If you successfully find one combination of quirks that works for your system, you can add them into /usr/lib/pm-utils/video-quirks to make them permanent. At the same time, please help to file a bug against the pm-utils package with a patch about your changes so it can benefit the mass. A common issue found on systems upgrading from old versions of Debian is the enabling of quirk-s3-bios freezes the system during suspend. If your system freezes during suspend, check the pm-suspend.log carefully after enabled debugging and make sure quirk-s3-bios is not used. The log of suspend and resume processes are in file /var/log/pm-suspend.log. It contains moderately verbose information by default. More information can be enabled for debugging by inserting line export PM_DEBUG=true into the beginning of file /usr/lib/pm-utils/pm-functions. For more, check out the info on Kernel testing facility mentioned at Suspend - Debian Wiki as well. This can help you debug and isolate the problem. Here's a full list of Kernel Parameters many being relevant to acpi and suspend. This seems to be a reported bug, check the link that follows. In case the problem is in a text console: Have you tried refreshing the fonts cache? This is almost certainly because the graphics driver has bugs for the display device. It probably won't matter too much which it is, because either way it's not something you can likely fix. But you should file a bug about the kernel driver for the device (once you figure out what it is (lspci may help here)). Something you could try, though, as a work around: when coming out of hibernate, try hitting "ctrl-alt-F4" to switch to another virtual terminal and then switching back (which is likely either ctrl-alt-F1 or ctrl-alt-F7 or maybe F8). This may do enough of a screen refresh that it'll make the display recover. Maybe. Well… then try issuing sudo chvt 1, then switch back to Xorg's vty using Ctrl_Alt_Fn or sudo chvt N (where N is usually 7 or 8). In case chvt would work, you can even try scripting it. Try rotating or flipping your screen with xrandr, e.g. upside-down and then back to normal. This might be enough to have it fully redrawn. Try Crtlalt- then Crtlalt+. That changes the screen resolution back and forth. Not the answer you're looking for? Browse other questions tagged linux xorg desktop desktop-environment hibernate or ask your own question. How to debug a suspend problem? when I switch user and log back to a lxsession session, are there some scripts or configuration files executed or read? KUbuntu 10.04 / Dolphin File Manager: Is there a way to make .desktop files display the filename the same as the NAME= in the metadata? Hibernate leaves me with blank screen after switching on on Linux Mint - what could have happened? can RandR display two parts of the same screen on one display?